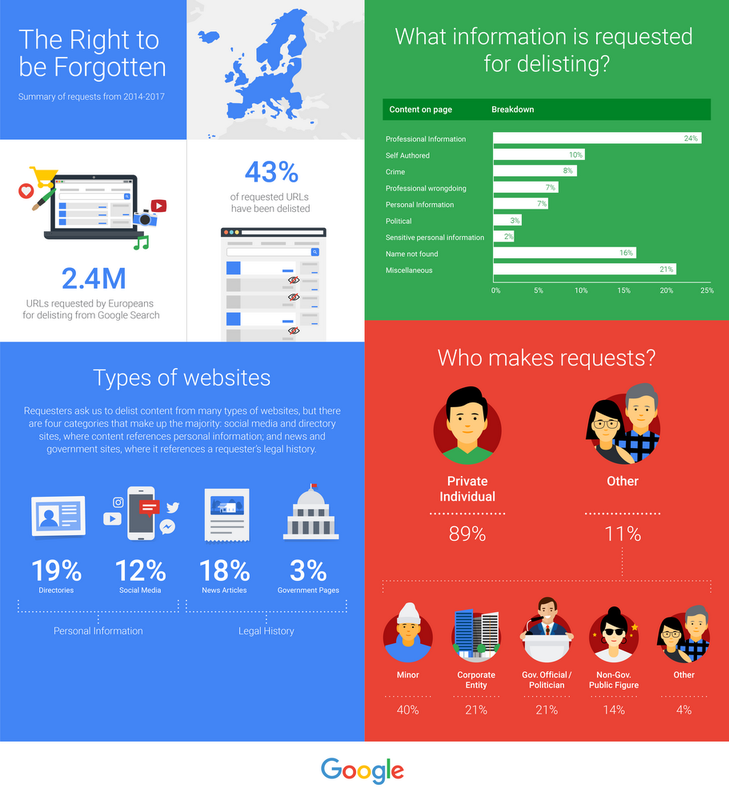 In May 2014, in a landmark ruling, the European Court of Justice established the “right to be forgotten,” or more accurately, the “right to delist,” allowing Europeans to ask search engines to delist information about themselves from search results. In deciding what to delist, search engines like Google must consider if the information in question is “inaccurate, inadequate, irrelevant or excessive”—and whether there is a public interest in the information remaining available in search results. Understanding how we make these types of decisions—and how people are using new rights like those granted by the European Court—is important. Since 2014, we’ve provided information about “right to be forgotten” delisting requests in our Transparency Report, including the number of URLs submitted to us, the number of URLs delisted and not delisted, and anonymized examples of some of the requests we have received. Requesters: We show a breakdown of the requests made by private individuals vs. non-private individuals—e.g., government officials or corporate entities. Content of the request: We classify the content that the individual has asked us to delist into a set of categories: personal information, professional information, crime, and name not found, meaning that we were not able to find the individual’s name on the page. Content of the site: When we evaluate a URL for potential delisting, we classify the website that hosts the page as a directory site, news site, social media, or other. Content delisting rate: This is the rate at which we delist content by category on a quarterly basis. In addition to updating the Transparency Report, we’re also providing a snapshot of our efforts to process these requests over the last three years. We hope the new data we’ve added to the Transparency Report and our research paper will help inform the ongoing discussion about the interplay between the right to privacy and the right to access lawful information online.